Why are hot tub covers important? Hot tub covers are a necessity for any new spa or hot tub. After all, your hot tub is a big investment, emotionally and financially. Not only is your hot tub a source of relaxation but also can became an oasis and source of family fun in your backyard. You’ll want your spa to last for years, which means protecting it from the elements and maintaining it. One easy way to protect any hot tub is through hot tub covers. 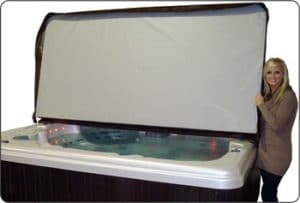 Each type of spa cover for sale at Aqua Living includes: two handles for easy carrying, four tie downs with keyed or keypad lock fasteners so they cannot be easily stolen, and a 5 year manufacturer’s warranty. 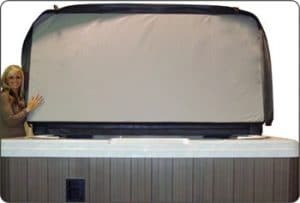 Find a durable spa cover for your hot tub at an affordable price today. 4″ x 2″ Tapered Foam Cover ideal for very moderate to moderate climates. 5″ x 3″ Tapered Foam Cover perfect for larger hot tubs in moderate to frigid environments. 6″ x 4″ Tapered Foam Cover made for large spas in frigid to arctic environments. 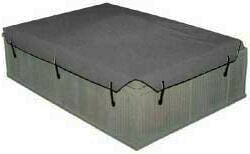 6″ x 4″ Tapered Foam Spa Cover with a glue galvanized channel reinforcement at the center hinge. This cover is ideal for larger spas in the coldest environments & can support the weight of up to two average adults. 4″ x 2″ Tapered Foam Covers with fiberglass sheets laminated on both sides. These versatile spa covers are manufactured to reduce water evaporation, keep debris out of your hot tub, and fit a wide variety of spa sizes.